It is a full near-to-me- attractions service application & a full historical guide. Explore the complete catalogs of every attraction/point of interest you may want: beaches & marinas (427), monuments (21), museums (220), arch. sites (310) & ski centers (23).Activate the GPS for a few seconds & find the close to you- attractions in real-time. 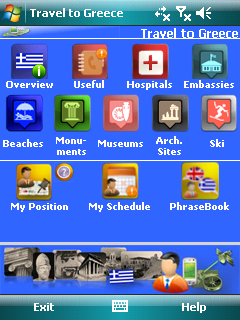 We also provide a built-in schedule organizer, a English-to-Greek phrasebook and the official embassies, hospitals and medical centers catalog.